This post is part of our special coverage of Tunisia Revolution 2011 . All Algerians saluted the resistance movement of the Tunisian people who brought down the despot Zine El Abidine Ben Ali  [EN] after 23 years of unchallenged rule. In every discussion forum, blogs and Facebook, Algerians can no longer find the words to salute the courage of Tunisians who have revolutionized their country by pushing “their” president to flee the country. “Who’s next?” That’s the question posed by another Algerian blogger, Fragments, after the announcement of President Ben Ali’s departure  [FR]. Commenting on the departure of the Tunisian despot  [FR], an Algerian internaute in a discussion forum compared Ben Ali to a rat rather than a leader. 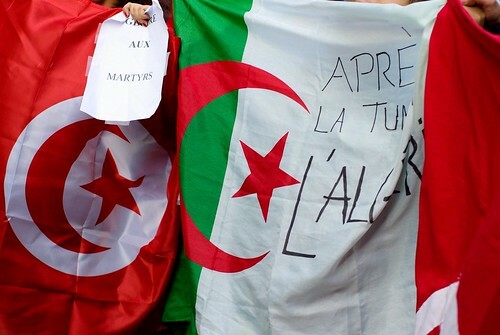 In an article titled “Tunisia-Algeria: similarities” [EN] published on his blog  [FR], the Algerian writer Makhlouf Bouaich, with a shred of pessimism finds similarities between the events that have transpired in Tunisia and those that Algeria experienced in the wake of the bloody riots in October 1988.